On March 17, 1970 at Dodgertown, Peter O’Malley was named President of the Dodgers, the 10th in team history, as his father Walter moved to Chairman of the Board. The symbolic baton exchange would lead to many more years of front office excellence. On the field, the Dodgers were derailed by the rival Big Red Machine, as Cincinnati won the initial season-opening series at Dodger Stadium and never looked back. When it was all said and done, the Dodgers finished 12 1/2 games behind the Reds. The Dodgers were without the services of pitcher Bill Singer for much of the season, as he missed 52 days with hepatitis and then had a second stint on the disabled list for the last seven weeks with a broken finger. However, Singer etched his name into the record books on July 20 when he tossed a 5-0 no-hitter against the Philadelphia Phillies at Dodger Stadium, getting Byron Browne to pop out to catcher Jeff Torborg in foul territory for the final out. Always sure-handed first baseman Wes Parker contributed clutch hits and batted .319 with 111 RBI and a league-leading 47 doubles. Parker was the first Dodger to drive in more than 100 RBI since Frank Howard and Tommy Davis did in 1962. 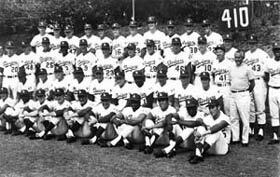 The Dodgers had four batters collect .300 or better averages: Parker, Ted Sizemore (.306), Willie Davis (.305) and Manny Mota (.305). Billy Grabarkewitz made his only All-Star appearance, pacing the team with 17 home runs and 95 walks. In an unusual season, hitting outpaced the normally reliable pitching for the Blue Crew. The Dodgers would have won the National League team batting championship for the first time since 1955 were it not for the San Francisco scorer changing a hit from Davis and making it an error. 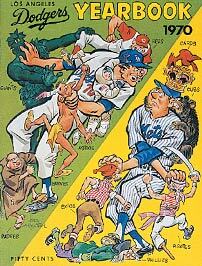 Cincinnati narrowly beat the Dodgers for the league hitting crown at .2703 to .2702. 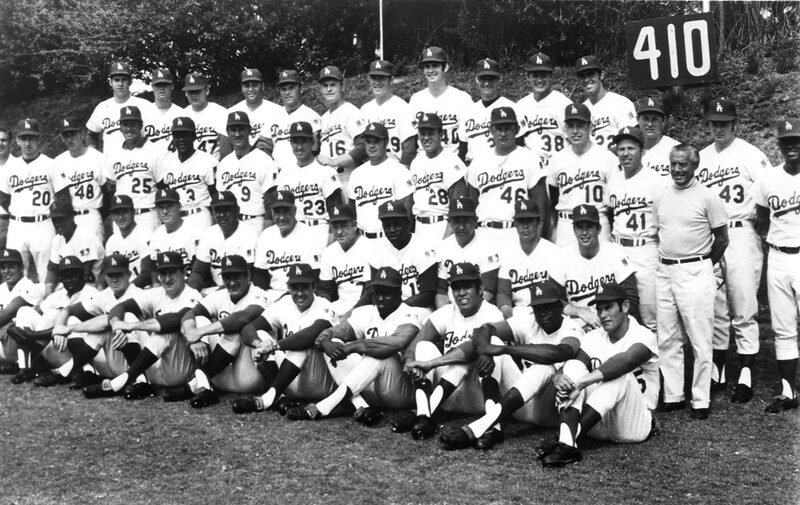 The Dodger pitching staff finished fifth in the league with a 3.82 ERA on the arms of youngsters Sandy Vance, Joe Moeller, Ray Lamb and Alan Foster, as well Singer, when healthy, and All-Star Claude Osteen (16-14). 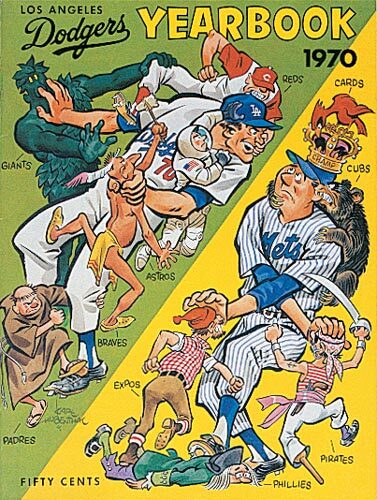 Click image for a larger view1970 Dodger YearbookCopyright © Los Angeles Dodgers, Inc.
Click image for a larger view1970 DodgersCopyright © Los Angeles Dodgers, Inc.